We were graced with another visit by the King, and for the first time in quite a while, the gang ended up back at Fook Lam Moon (福臨門). This used to be the default venue for our gatherings for a long time, but we've kinda been a little more adventurous over the last couple of years. I was pretty happy to come back for some familiar dishes. As my stomach hasn't been feeling well for the last couple of days, I asked to take things easy tonight. Double-boiled soup with tripe and ginkgo nuts (白果豬肚湯) - warm soup is always good when you have stomach problems. I was really happy to start with this... as my stomach gets relief from the warm, soothing liquid. The tripe and the pork belly from the plate of "dregs" were pretty damn tasty, too. 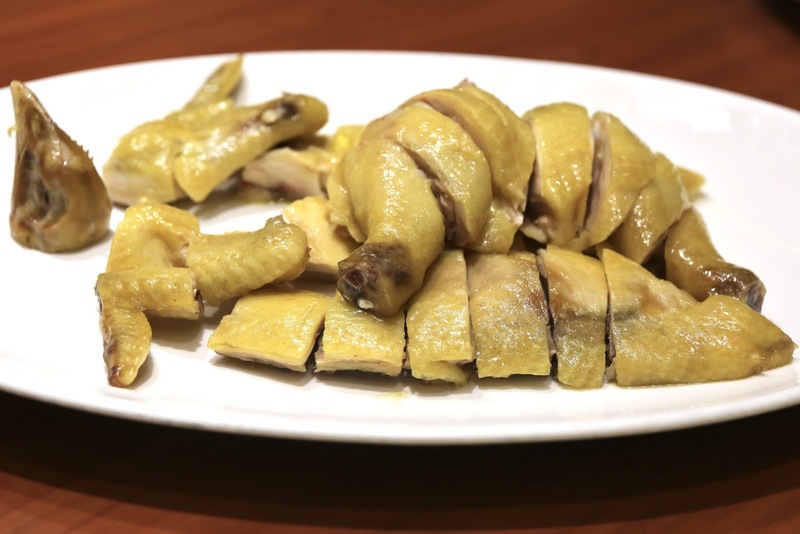 Salted steamed chicken (鹹切雞) - I'm glad we didn't get the crispy chicken as we usually do. This was pretty perfect - right in the middle in terms of salt between the crispy chicken (which can be pretty bland except for the skin) and the salt-baked chicken (which can be over salty). 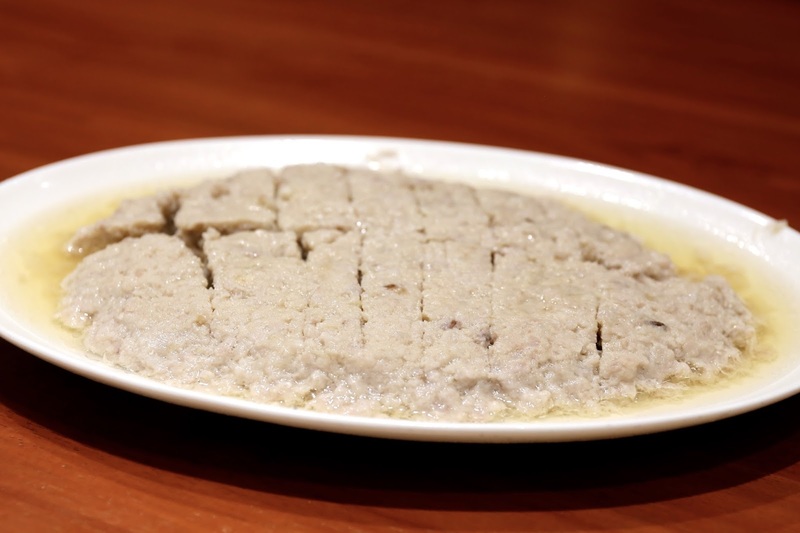 Steamed pork patty with salted fish (鹹魚蒸肉餅) - more comfort food, requested by our visitor. 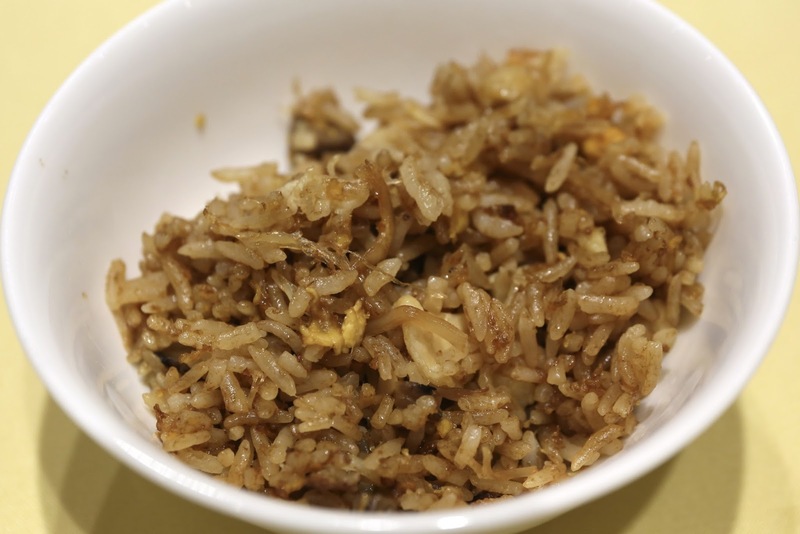 Perfect over some steamed rice. Here one has a choice of having the salted fish all mashed up and blended with the pork (which was what we had) or having the fish in chunks on top of the pork. The pork was very finely chopped, which gave a very smooth texture. Pan-fried leopard coral trout (煎封東星斑) - as much as I enjoy Cantonese steamed fish, I do like a change of pace once in a while... and they do a pretty good job with the pan-fried variant here. Braised pomelo skin with shrimp roe (蝦籽炆柚皮) - we love our pomelo skin, so we ordered up two variants. The good thing was that I didn't taste any bitterness, although there was a wee hint of the fibrous tissue. The shrimp roe, of course, made things very, very tasty. Braised pomelo skin with abalone sauce (鮑汁炆柚皮) - but the "simpler" version with abalone sauce wasn't bad, either. Steamed rice wrapped in lotus leaf (鮮荷葉飯) - we already had some steamed rice with the pork patty as well as the pomelo skin, but this was still immensely enjoyable. Almond cream (杏仁茶) - I was kinda stuffed and feeling uncomfortable already, and had thought about skipping dessert. In the end I succumbed and had a bowl of the delicious almond cream, although I chose to skip the egg whites. 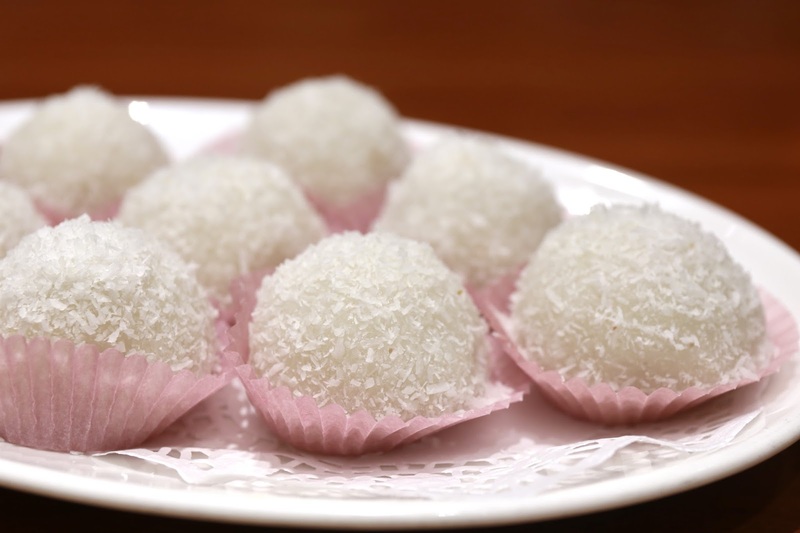 Glutinous rice dumpling (糯米滋) - this came complimentary along with the fruit plate. In retrospect I probably shouldn't have taken one of these... as glutinous rice is harder to digest. 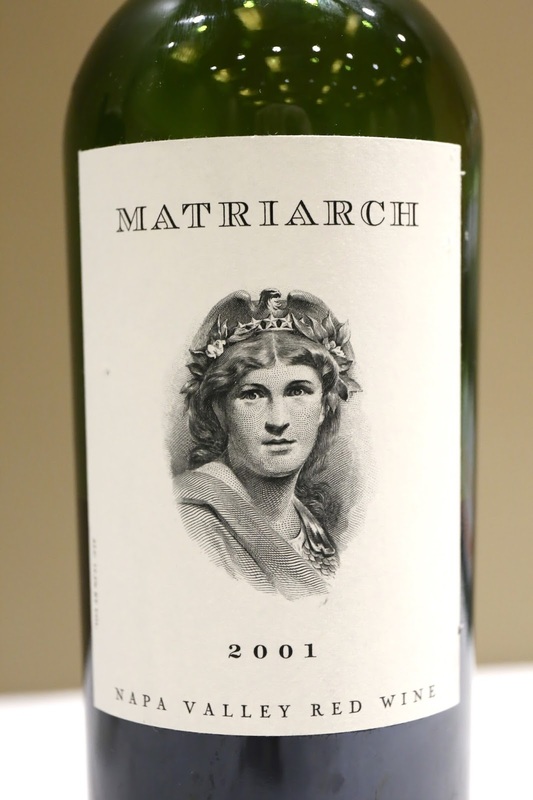 2001 BOND Matriarch - double-decanted 45 minutes prior to serving. Very fragrant nose, with some coconut butter, cedar, and nice fruit. Initially dry on the palate, but became sweeter with time. Still full-bodied after 15 years, even after throwing off a ton of sediment.